DERMA E Anti-Wrinkle Night Serum formula contains ingredients that have been known to be effective in offering moisturizing and anti-aging benefits. DERMA E Anti-Wrinkle Night Serum claims to stimulate the renewal of surface skin to reveal a more healthy and youthful complexion. However, is it the best Anti-Wrinkle Night Serum? This review examines the products ingredients as well as its customer support to determine if this product would be a worthy purchase. The above-listed ingredients are a few of those listed in the formula. These ingredients are 100% vegan, are cruelty-free, and free of various potential irritants such as parabens, sulfates, mineral oils, lanolin, gluten, and GMOs. However, this product is not produced in a GMP certified facility. Looking at the ingredients: Glycerine and avocado oil provide moisturizing properties while Vitamin E and green tea are high in antioxidants. Vitamin A promotes cell production and growth. Together, these ingredients form part of a synergistic blend that protects the skin from oxidative damage, reduces the appearance of wrinkles and other signs of aging, as well as promote a hydrated and rejuvenated complexion. However, this product does not contain any patented ingredients. This is a concern as the lack thereof may limit the product’s effectiveness in providing targeted relief from signs of aging. Leading brands have up to 6 patented ingredients, including collagen-boosting Syn-Coll and stem cell reviving PhytoCell Tec Alp Rose. The manufacturer suggests applying this product once the skin has been cleansed and toned. To apply, dispense the product from the pump bottle onto fingertips and massage onto face and neck. We are uncertain as to how many pumps are required per use. This product is intended for use at night and may be layered under a moisturizer. There is no information pertaining to the concentration of the key active ingredients. 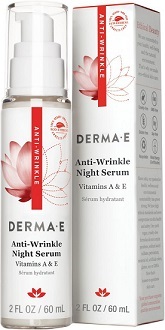 DERMA E Anti-Wrinkle Night Serum can be purchased directly from the manufacturer’s website, where a 2 oz pump bottle retails for $18.75. This seems relatively affordable, however, we are uncertain as to how long 1 bottle would last. There is a 10% discount available when purchased via subscription, although these schemes tend to be difficult to cancel and you may be billed for a product you no longer want. Otherwise, there are no bulk deals available. DERMA E offers a 100% money-back guarantee for products purchased from the manufacturer’s website. This guarantee is extended to 30 days from purchase. While this may seem to inspire some confidence in the customer support, there is no information stating the level of product use that will be applicable for a return. In saying so, we cannot say if customers who have tested their product will be able to receive a refund. There have been a few customer reviews complaining that the product’s consistency is ‘goopy’ and has a horrible smell to it. DERMA E Anti-Wrinkle Night Serum formula contains ingredients that have been known to be effective in offering moisturizing and anti-aging benefits. However, the concentration of these ingredients is not disclosed so we cannot say for sure that the formula will be effective in fulfilling its claims. The lack of any patented ingredients is also a concern as it may make this product less effective than competitor brands that include these tested and targeted ingredients. Although the price is affordable, there is no bulk offers to promote the long-term use of this product. While there is a manufacturer guarantee, it is vague and limited. In saying so, we do not recommend this product as the best anti-wrinkle night serum available on the market.